Once upon a time the most sophisticated sound a computer could make was the beep that it makes after power up; indicating that it had started ok. Later it became possible to modulate the sound so that it could make different types of noises, but hardly what could be termed sophisticated soundscapes. Audio reproduction has always been a lossy process, this means that what you are listening to at home is never as good as the Master tracks produced at the studio. This is true of CD’s and whether Audiophiles agree or not is irrelevant it IS also true of Vinyl LPs too. However with the advent of high quality audio hardware there is no need for the fidelity of audio to be constrained simply by its storage media. It was the advent of the dedicated sound card that finally brought PC audio in to the modern era of audio reproduction. Now however, most modern PC’s carry audio devices built into the motherboards of the machine. These devices used to be dreadful and though they have improved over the years they are by no means a substitute for a proper audio card. Generally referred to as on-board audio cards, motherboard devices lack EMI (Electromagnetic Interference) shielding and carry all the noise of the motherboard over their unshielded connectors. Most also fail to implement the AC97 (Audio Codec 97) standard which allows you to record ‘what you hear’ through a loopback device/feature that is not present on most motherboard devices. Also most of these devices do not feature an actual audio processor meaning that the real work is carried out by the CPU. Additionally because of the lack of shielding, samples and recordings made on or by these devices are of a much lower standard than can be achieved with an audio card. Having said all that many people will allude to them being ‘good enough’ (however mistaken those individuals are). Some motherboards actually feature proper audio hardware integrated into the motherboard circuitry, the boards that do feature an actual sound processor tend to be more expensive and there are only a handful of them available. This PCIe (Peripheral Component Interconnect express) sound card represents the creme de la creme of high end studio grade consumer computer audio. The ZXR is not simply one card, but two, although the device itself only requires a single occupied slot within a computer since the secondary (smaller) daughter board/card is connected to the main one via a provided signal cable and not by a PCIe slot. Each of the two boards contains it’s own audio processor, each card employs significant EMI shielding to isolate the audio signal from the background noise of the other electronics in the computer which can be significant. This card boasts digital inputs and outputs in the form of Optical TOSLink/SPDif connections. it also sports analogue input’s and outputs as well and supports a linear resolution of 24 Bits and output a dynamic frequency range of 192Khz. 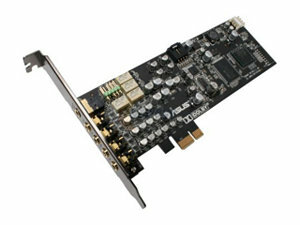 This card can also deliver a 7.1 signal to drive the most sophisticated home theater audio systems available currently. This card is THX TruStudio Pro and ASIO certified. This top of the range audio device is the culmination of many years of trial and error and like all technology it is built on the foundations of earlier devices that preceded it. PC’s were not considered viable audio platforms for much of their early years. With the most sophisticated sound it could produce being the beep it made when it started. The speaker however, is limited to square waveforms. In the early days several companies developed techniques for digital sound reproduction over the PC speaker the most notable of these companies was Access Software. Needless to say the resulting ‘Audio’ was barely functional and suffered from low volume that could not be adjusted, severe distortion and signal degradation. Additionally all other processing on other tasks had to stop while the PC hardware was used in this fashion. 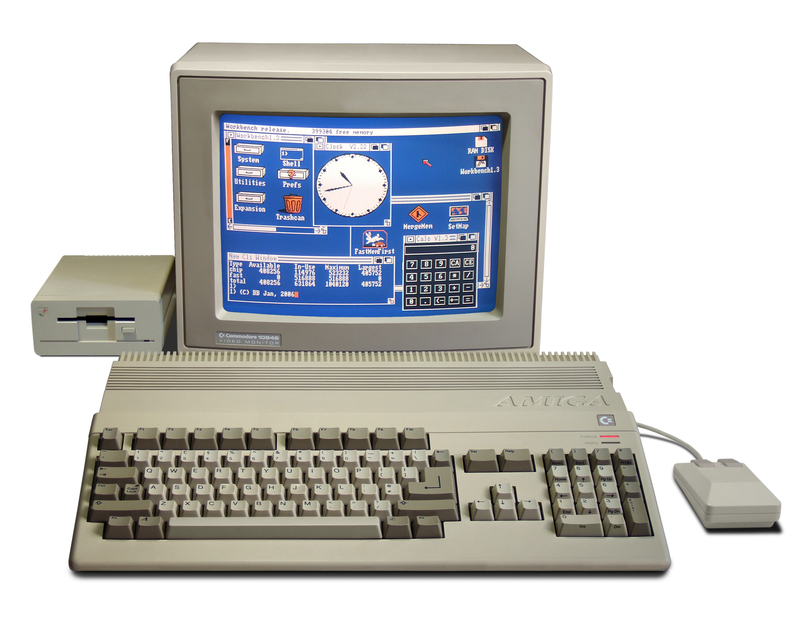 Although I have pictured the 1987 model the Amiga’s earliest rendition surfaced in the form of the A1000 released a couple of years beforehand. However despite the pictured machine’s A500 moniker it contained the same hardware as the A1000 and introduced the world to something extraordinary for the era. The Amiga could do what a PC couldn’t, it could produce multi-channel stereo sound at near CD Quality in the mid 1980’s. It used a separate audio processor to do the work liberating the CPU for other tasks. This computer and its Atari ST competitor (which featured MIDI sequencer connectors) when combined with the synthesizers and sequencer’s of the era formed the backbone of the electronic music revolution that started in the 1980’s. It was through the introduction of machines like the Amiga that spurred a multimedia computer revolution with the ability to reproduce sound and video at its heart. But early PC audio cards were as simple as they were woeful. In the early 1980’s PC audio was not targeted originally at gaming or even the reproduction/playback of Audio but rather specific audio applications such as composition and speech synthesis. Connected to the 8Bit ISA (Industry Standard Architecture) interface these devices were rudimentary at best (note the hardware volume control knob) and without adequate shielding they carried all the background noise of the computer on the signal they output if they could output anything at all. 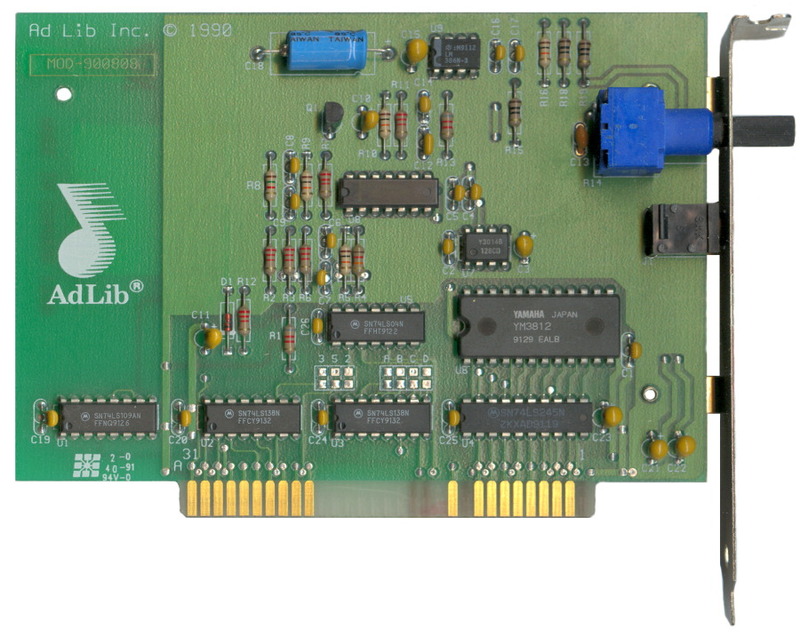 The AdLib card from 1989 featured a Yamaha YM3812 chip and was capable of 9 separate internal channels (best thought of as 9 individual tracks) which could be individually programmed, a percussion mode that added an additional 3 channels though infrequently used because of its inflexibility. The card could combine these separate programmed channels and output a mono audio signal. It wasn’t long before it was joined by a competitor. This card was launched shortly after the AdLib Card and unlike the AdLib card it could produce a stereo output, however this device was based on a Philips SAA1099 chip which, much like the PC speaker, was a square wave generator. The card could produce 12 channels of audio which it mixed into a stereo output, however the resulting output sounded like 12 PC speaksers, beeping, booping and chirruping along all at once. Unsurprisingly the card did not sell well and despite a later re-branding to ‘Game Blaster’ and heavy marketing continued to sell poorly. It wasn’t until Games companies became involved in the late 1980’s and early 1990’s that the function of the dedicated sound card would become fully realised. Games were starting to become more sophisticated in their outlook and as such required more from the basic PC hardware that underpinned the games. This prompted Creative Labs to release its seminal product.. The Creative Labs Sound Blaster. When launched the AdLib card had already secured much of the market for PC audio with thanks to the support for the AdLib device in games. However, the Sound Blaster had two significant tricks up its sleeves firstly; it had an integrated game port, a port to which a controller such as a joystick could be connected and secondly; it incorporated a Yamaha YM3812 chip ensuring perfect compatibility with games that were developed for the AdLib card. 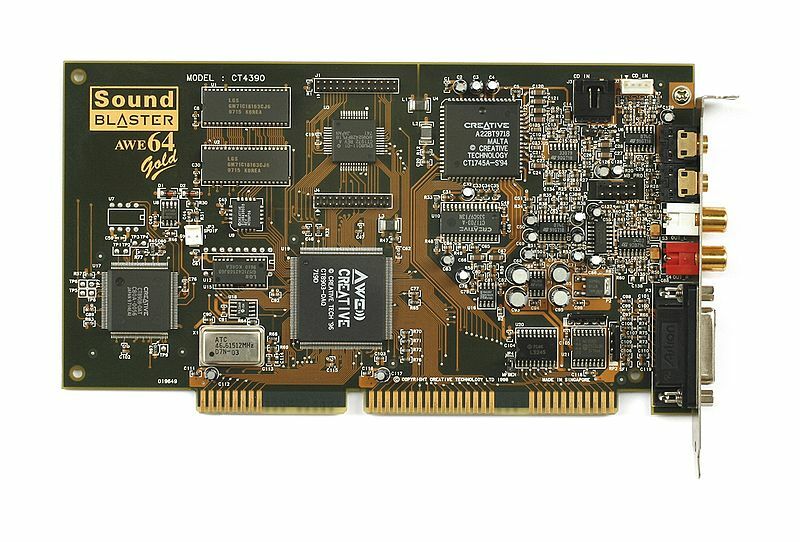 Additionally the Sound Blaster incorporated a DSP (Digital Sound Processor as opposed to Signal) that was a simple Intel controller chip that could playback mono sound samples at up to 22Khz (close to FM quality) and sample at up to 12Khz (roughly AM quality). Despite the limitations of the card, the significance of the included Game Port ensured success for the Sound Blaster. Firstly game port controller cards usually required a separate additional slot and cost around $50-$60 at the time. The Sound Blaster fused a game port to a sound card and retailed at no extra cost or sometimes even lower than the AdLib card. 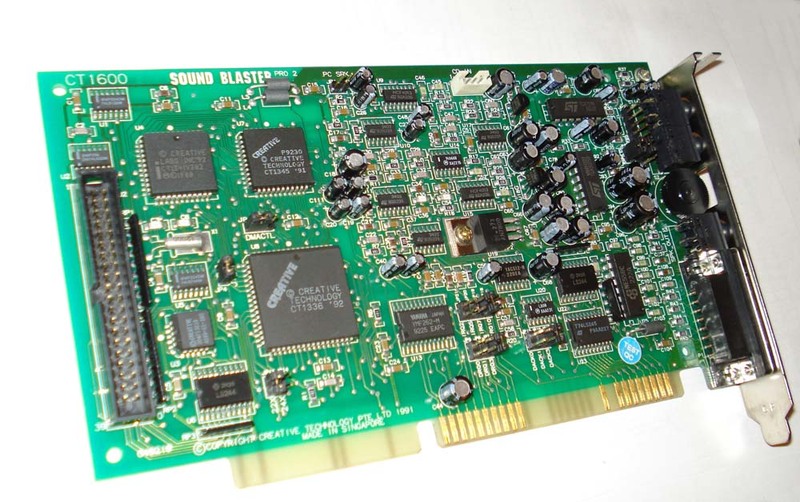 In the 90’s the Sound Blaster series of cards were combined with cheap CD ROM drives and helped usher in a multimedia revolution that would lead to the modern era of sound reproduction. Originally in the early days of CD ROM, CD drives were not connected to the motherboard’s own on-board disk controllers. They were connected directly to the sound card device (via the large connector at the back end of the card) which meant that it was the sound card that exchanged data from CD ROM’s to the computer, this had the added advantage that audio played back from a standard CD could be overlaid and presented as a soundtrack to whatever game you were playing. 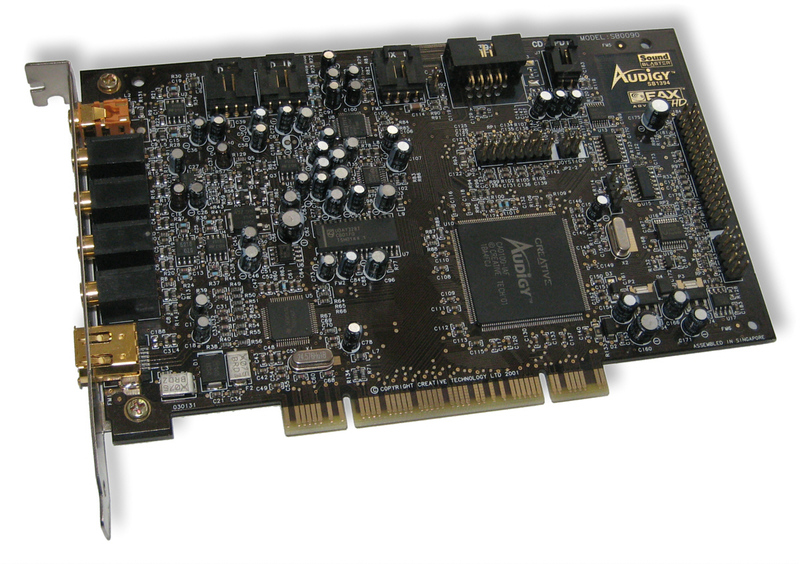 Additionally the Sound Blaster Pro 2 was fully backwards compatible with the first Sound Blaster, and it was possible to simply purchase the audio processor chip and replace the one on the original Sound Blaster card to achieve the same standards of audio reproduction, though the Sound Blaster had no CD ROM controller. The Pro line was short-lived however, the increasing demands that consumer’s were placing on computers meant that a jump in bandwidth was required. 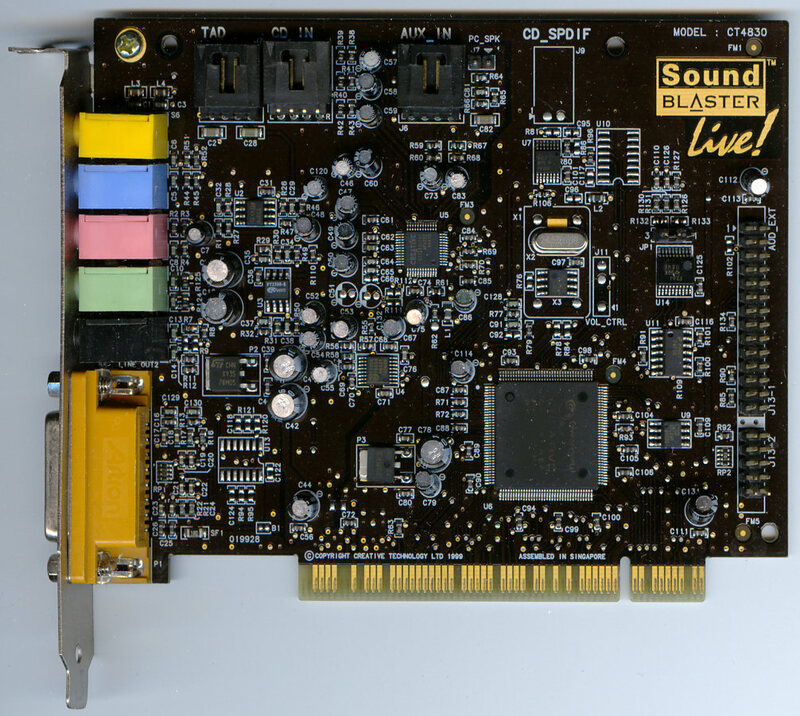 Creative Labs Sound Blaster cards became synonymous with PC’s. Having essentially captured the market for PC Audio by selling bundled kits of CD Drives and Sound Cards not just simply to individuals but to actual PC production companies like Olivetti and Dell. These kits were in-expensive and secured market dominance for Creative Labs. However improving hardware capabilities in computers permitted the introduction of a sound card that became a de-facto industry standard. Announced in 1992, the Sound Blaster 16 introduced 16 Bit CD-Quality digital audio sampling, MPU-401 compatibility for professional MIDI equipment connections, a socket for an optional Advanced Signal Processor and a connector for a wavetable daughter card. The card differed from the Pro 2 in that due to the increasing complexity of PC motherboards it was no longer necessary to carry a CD ROM controller on the audio card, however it was necessary to carry CD audio interfaces (the white connectors and the black one on the top edge of the card) which in turn could be connected to the audio output of the CD Drive. This did not mean that all cards were CD Rom Controller free as it takes time for new technology to trickle through the market. Many of Creative’s later cards would also include such an interface before being dropped altogether. Arguably the longest sound card ever made and released in 1994 the AWE (Advanced Wave Effects) 32 introduced a new MIDI synthesizer component based on the EMU8000 processor. The card consisted of two different but key functions; digital audio and; the MIDI synthesizer which consisted of the EMU 8000 chip 1MB of sample ROM and 512kb of sample RAM. This RAM could be supplemented via the RAM sockets located in the top left corner of the card (and are populated in this picture). The AWE32 formed the basis of the Creative Labs range during the mid 90’s. 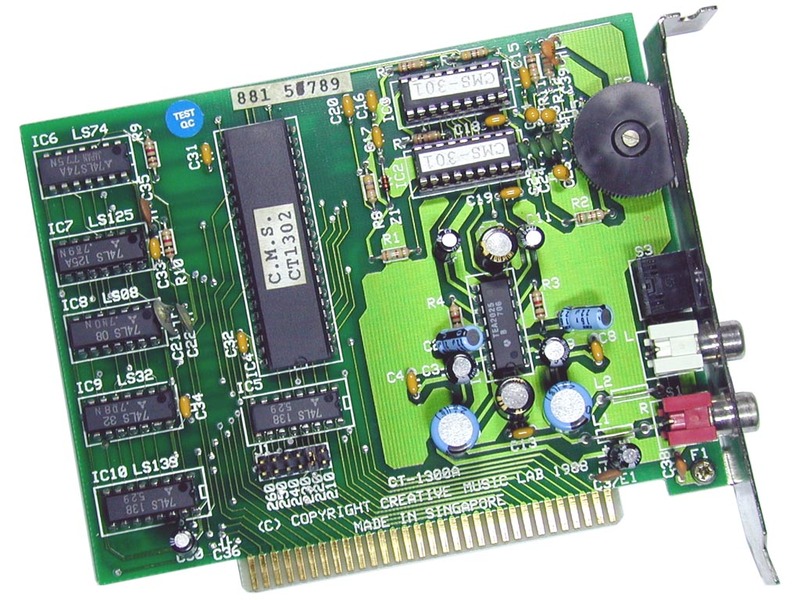 Creative would produce two more cards based around the EMU8000. First was the Sound Blaster 32 which was a more tightly integrated version of the AWE 32. This resulted in a shortening of the card’s length. Naturally this in turn led to the second card; the successor of the AWE32. This card had several key benefits over it’s lengthier predecessors. Firstly of course is the size of the card, tighter integration allowed Creative to shrink the card from the Full ISA to a half ISA card. it offered similar features but included support for increased polyphony (albeit the additional 32 channels were generated in software by the CPU). The memory slots from the AWE 32 were replaced with proprietary memory sockets making the memory particularly expensive as it was only available from Creative. Available in three editions the value, standard and Gold. With the key differences between them being increased RAM; the gold however, incorporated something extra. an S/PDIF connector. One of the very first audio cards to do so. This marked the beginning of digital audio cards providing a true digital audio output. However, the 16 Bit interface was living on borrowed time and sure enough as the 90’s progressed ISA was steadily superseded by PCI. The era of PCI and multi-channel audio. It should be clear by now that advances in audio reproduction were led by advances in the interface standards that connect devices like Sound Cards to the computer. As the interface bandwidth increased so too did the functionality and capability of the sound hardware connected to the interface. The same is true of GPU technology and almost any PC technology. As ISA gave way to the 32Bit PCI (Peripheral Component Interconnect) standard it became unnecessary to connect an audio cable from the CD Drive to the sound card since digital audio could be routed through the motherboard. In addition to the PCI standard, the prevalence of digital connections increased the availability of stereo/hi-fi components that could use multi-channel audio (audio that is more than just simply left and right). This made the introduction of this as a standard feature to PC audio cards a certainty. Though Creative Labs development of it’s own audio range had become stagnated. Thanks to its increased bandwidth and sophistication PCI heralded not only a new interface type but new competition in a market place that was dominated by Creative Labs. Most notably that competition came in the form of Ensoniq. 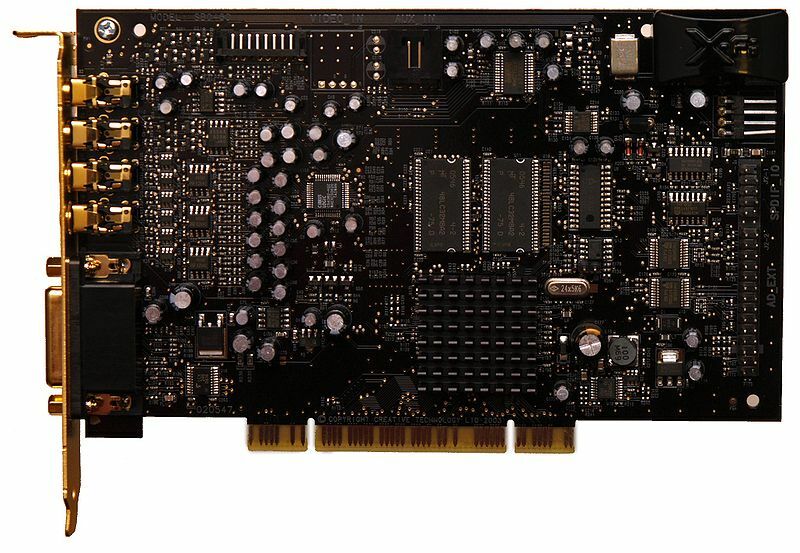 In the early days of PCI Creative Labs simply produced PCI versions of its Sound Blaster 16 and other products. This stagnation opened the door to competition. Ensoniq manufactured the AudioPCI card which was extremely popular with OEM corporations at the time. This card featured wavetable MIDI, DirectSound3D support which is part of the Windows DirectX API used heavily in games. It also featured full DOS legacy support for older machines and software titles. The card itself was extremely cheap to produce because it lacked actual processing hardware to perform or accelerate most of its functions. These operations in turn were carried out by the CPU. However due to the increasing competition Creative was experiencing in the late 90’s it bought Ensoniq in 1998. Creative then released many cards using the original AudioPCI chip. It wasn’t until later in the year that Creative Labs developed a new audio processor for the new generation PCI interface. Introduced in 1998 the Live! was built around creative Lab’s new EMU10K1 processor which contained 2.44 million transistors and could perform 1,000 MIPS (1 MIPS equates to around 1 Million instructions per second). With thanks to the extended 32Bit bus the on-board audio processor no longer required RAM modules to be installed on the card since it could directly access system RAM via the 32bit PCI interface. All of the cards in the Live! range could produce multi-channel audio with the minimum being 4 channel surround sound. For games Creative introduced EAX (Environmental Audio Extensions) which added hardware accelerated acoustic effects, the EMU10K1 provided a high quality 64 voice synthesizer which could access new audio samples directly from the system RAM. In 2001 the Audigy was launched. 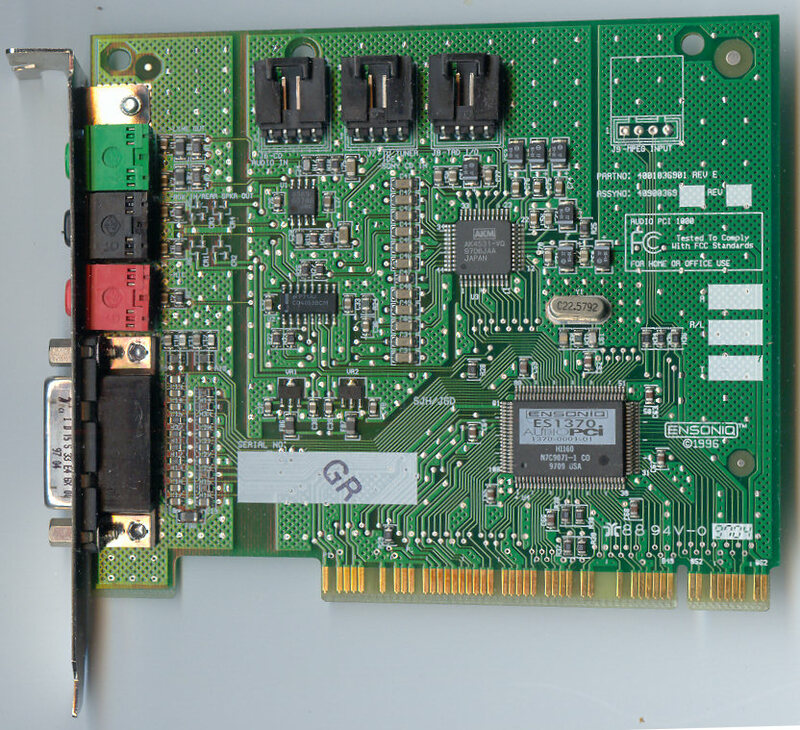 This PCI card featured the EMU10K2 audio processor which could process up to four EAX envrionments simultaneously by using an upgraded DSP and enhanced EAX3 HD support. The card also offered 5.1 channel output, though it was not without its controversy. Even though its sound processor was fixed at a 16Bit linear resolution with a 48Khz dynamic range the Audigy was advertised and marketed as a 24Bit card. Despite the marketing the EMU10K2 processor offered no higher precision than the earlier 16Bit Live! 5.1. Additionally the card had to re-sample all the audio produced to 48Khz so that the DSP could produce an output signal. This process was done very poorly by the processor on the card introducing noise and audio artefacts resulting in less than satisfactory results. The Audigy 2 which was released in 2002 featured an updated EMU10K2 processor sometimes referred to as EMU10K2.5 because of its significant improvement over the original. This audio processor included an improved engine that was capable of 24Bit precision but also it could produce 192Khz stereo audio. Audio was capped at 96Khz for multi-channel 5.1, 6.1 and (eventually) 7.1 output. The card also featured an improved SNR of 106db instead of 100db over the original Audigy. In addition to this the card incorporated Dolby Digital EX 6.1 and 7.1 decoding for improved DVD playback capabilities. The Audigy 2 series were the first ever to achieve THX certification. Additionally the re-sampling technology was vastly improved attributable in part to improvements in the audio processor but also in the cards EMI shielding. However Creative Labs would go on to produce versions 3 and 4 of the same basic design. During the mid 2000’s Intel introduced a new Interface standard known as PCIe (Peripheral Component Interconnect express) and as with PCI uptake was slow to start. Seeking to leverage the interface for a new generation of cards Creative launched the X-Fi (Extreme Fidelity) series in 2005. 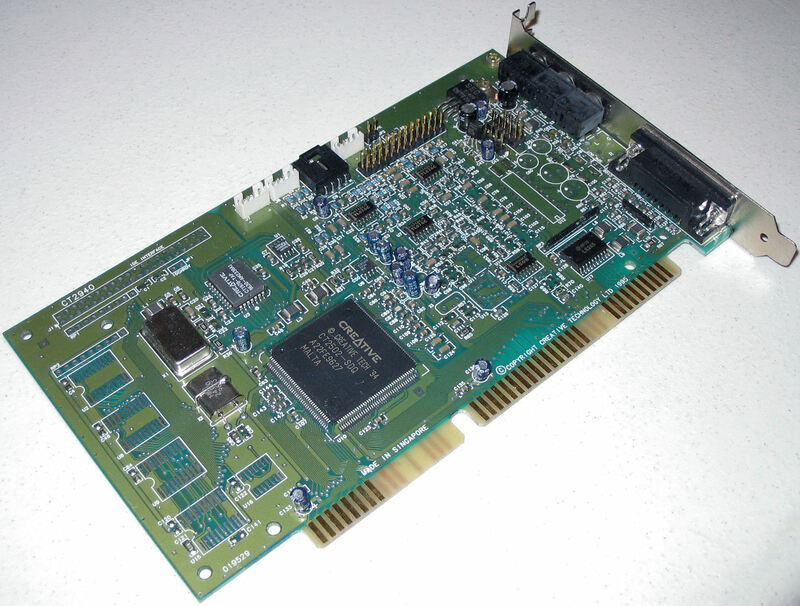 This card was originally produced for the PCI interface but would properly scale to PCIe featured the EMU20K1 (or the EMU20K2 for the Titanium X-Fi models) a 51 million transistor processor operating at 400mhz it was capable of 10,000MIPS which was around 24 times higher than the previous generation. Although the pictured card is a PCI version the series transitioned to the newer PCIe standard. From that point on Creative rested on its laurels and merely produced PCIe versions of existing models. Asus are best known as a producer and manufacturer of world class hardware components for computer enthusiasts. They produce everything from the highest end Video cards to world record holding motherboards for PC’s. But in 2008 they saw a stagnating audio market and seized the initiative to introduce the world to its own brand of audio hardware… The Xonar. The Asus Xonar DX was not only compatible with Creative Labs EAX technology but it exploited the fact that Creative failed to produce functional drivers for many of its older cards for the Windows Vista Operating System. Creative was simply relying on people to purchase new expensive cards that it asserted as Vista compatible however the compatibility issue was simply software based not hardware. Drivers are low level programs that are supplied with a device that instruct the OS on how the device should be utilised along with its features. By failing to produce Vista drivers for their older cards Creative rendered them either non-functional or usable with a minimal set of features within Vista. Asus exploited both the driver issues Creative was hoping to exploit for its own gain and the fact that Creative had not launched a new Audio processor in several years. The Asus Xonar DX remains extremely popular to this day as a low cost, highly featured card though it lacks sophisticated shielding and its dynamic audio range is limited. It featured DTS (Dolby Theatre Sound) on its digital output connector. Asus went on to manufacture some of the most highly regarded PC audio hardware. in August 2008 Asus launched the XONAR HDAV 1.3 which was the first audio card that enabled lossless HD audio reproduction on surround sound decoder/receivers. This technology found its way into later Asus audio cards such as the excellent award winning, THX certified Xonar Essence STX. Realising a significant threat to its core business Creative labs retaliated. Announced in 2011 this range of audio cards featured a new integrated Sound Core 3D audio processor which features the Quartet DSP from the X-Fi range as well as integrating a DAC (Digital to Audio Converter) and ADC (Analogue to Digital Converter). The range had been met with a positive reception however, not without controversy. Available in 3 primary editions the Recon3D PCIe, Recon3D Professional and Recon3D Fatal1ty champion; the reality is that very little separates these cards in terms of features or performance. The differences in the models are very minor between the low and mid range card which feature only a cosmetic difference despite an incredible price disparity between the two. The Fatal1ty Professional adds a Microphone some red LED’s and a Metal cover that offers no function at all for an even more exorbitant price. However the SoundCore processor and its featureset was not fully exploited until the Sound Blaster Z series was launched in 2012. This series also has three cards. However, Creative chose to address the criticism’s over the pricing Recon3D range by offering cards that actually had wide functional variance. 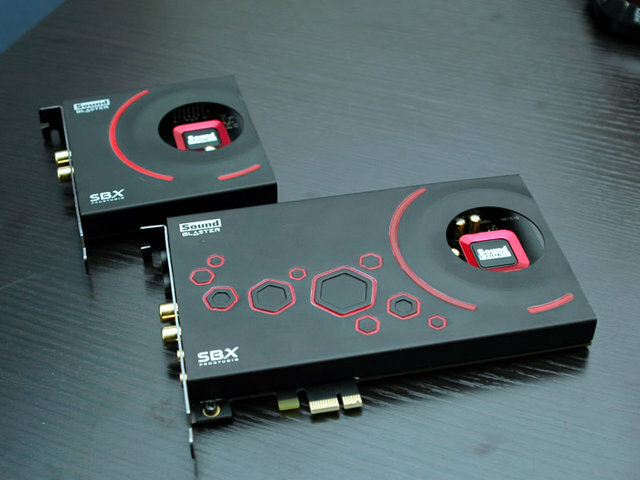 The Sound Blaster Z is the baseline card and features an SNR of 116db, hardware DACs a dedicated headphone jack with a 600 ohm amplifier and a bundled beamforming directional mic. 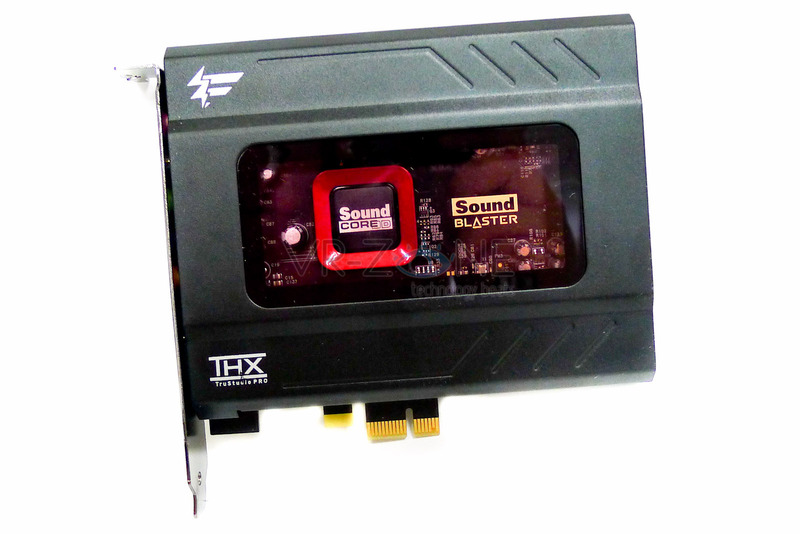 The Sound Blaster Zx is essentially the same card but it comes equipped with an external Audio Control Module, which is a breakout box with independent headphone and microphone jacks along with an independent volume control. The ZxR is the top of the line of the series and features an entirely different circuit board design. The card inherits the same features from the Z and the Zx but extends this further. Welcome to the modern age of PC audio, this is the very card that this article opened with. 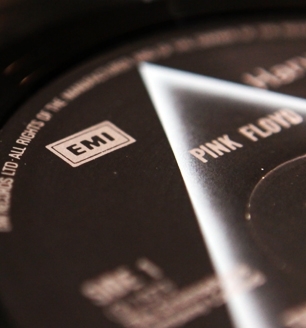 It’s a convoluted road tied to technological developments, competition and the push by consumers for the best possible products to achieve the highest audio fidelity from their computers. From the early days of a beep to modern multi-channel surround sound. It’s a tale that has taken 30 years to arrive at this point. While audio reproduction is now fairly well understood and very well represented in the world of computer audio I feel that the story has not yet ended. The pace of PC audio progress has certainly outstripped the pre-recorded offerings produced by record studios but with thanks to a combination of games, movies, multimedia and professional use of audio we have all benefited from the increasing quality of the humble PC’s audio reproduction. I can only hope that record studios will begin to offer an improved product too.